Thank you for your time this morning to discuss the senior manager position with your firm. I believe my experience is a great match for this position, and I look forward to meeting with you if I am selected for the second round of interviews. I appreciate your thoughtful consideration. I was pleased to receive your thank you note this afternoon. Same day courier service is unheard of in the thank you note tradition. I hope to be in touch soon on whether you advance in the interview process. Thank you for your thank you note. I am so glad you appreciated the courier service I selected. I thought that would be a nice touch. It says a lot about you that such a gesture would not go unnoticed. I am poised to bring similar unique systems and strategies to the table should I be selected for this managerial role. I was pleased to receive your thank you note. I see that courier service was not an option this time? 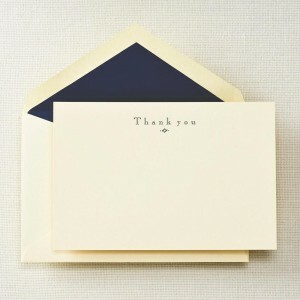 Still, you can never go wrong sending a thank you note. The homemade salsa was a nice touch. Thank you for enjoying the homemade salsa. I’ll tell my mom you liked it. I never said I enjoyed the salsa, but I thank you nonetheless for your note. I apologize for reading too much into your second-to-last thank you — so thank you for that. I need to be better about not assuming things. I assume that’s the primary reason I didn’t advance to the second round of interviews?? But I thank you for the correspondence. Thank you so much for thanking me in your apology. You are perhaps the most considerate former job candidate I have ever encountered in my 4 years in Human Resources. Thank you for your last thank you. Thank you for the holiday newsletter and family portrait enclosed in your last thank you note. I have placed it in your résumé file for future reference should there be an opening that best matches your skill set. In the event of such a match, we will notify you of our interest and provide you with the option to enter the candidate pool for employment with our firm. Thank you for placing the picture of my family and holiday newsletter in my résumé file. I don’t like putting the accents in résumé, but following your lead, I have made that choice. Your note about the accents in résumé gave me pause, for which I thank you. I have never liked them. It is with great pleasure that I provide you with an updated resume (note the accent-free “resume”) that includes a recent accomplishment under the “Hobbies and Other Interests” section. And thank you for freeing me of the accents in resume! One more thing – Mom wanted me to send you the salsa recipe for Christmas, so here you go! Thank you for the updated résumé and recipe to be added to your file. Thank you for adding the updated résumé and recipe to my file. Just to be clear, the recipe was for you and not my file. I also noted in your thank you note that the accents in résumé have returned. I needed that correction. Thank you. Thank you for reading this post. Really. I appreciate it. Now read Part 2! Sign up HERE to be notified of future posts! Fantastic exchange of thank you notes. Thanks for sharing.